Heat the olive oil in a medium-size sauce pan and sauté the onions over medium heat until soft and lightly colored. Pour in the wine. Puree the tomatoes in a food processor. Add them to the pot. Add water or stock and bring to a boil. Reduce heat and simmer for 10 – 12 minutes. Add the bulgur wheat, trahana or pastina. Continue simmering until the bulgur, trahana or pastina is soft, about 8 -12 minutes. 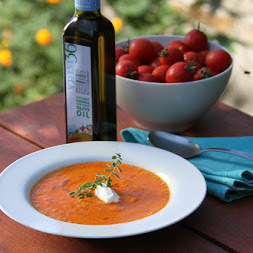 To serve: Place a ladleful or more of soup in each serving bowl and top with a dollop or teaspoon of Greek yogurt. Drizzle with the Vrisi 36 oregano-infused olive oil. Serve.